Take your graph of atmospheric temperature with altitude (immediately under “stratospheric basics”) and move the whole curve upwards. Then at any given altitude in the troposphere you can see the temperature rise, and at any given altitude in the stratosphere you can see it fall. That’s an idea based on the reasoning you quote from Ramanathan 1998, and the Soden/Held diagram to explain the effect in the troposphere that I cited in the last post. When I first heard of the predicted stratospheric cooling, my first reaction was to dismiss the issue as an easy one: “Of course it cools. After all, more heat remains trapped in the stratosphere”. When I looked for deeper explanations, I was surprised by its complexity. Even Gavin Schmidt had a hard time with the conceptual explanation. Is this a “greenhouse effect upside down”? CO2 preventing heat to come down from higher layers in the stratosphere? 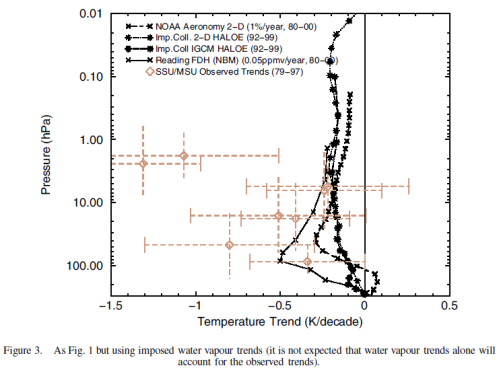 More substantively, what do you think of Solomon et al on stratospheric water vapor? Will their results hold up, and if they do, could this be why the recent trend is more like .16C/decade than the models’ .2C/decade? I think I was using “painful” in that way without really thinking about it. More substantively, what do you think of Solomon et al on stratospheric water vapor? What was interesting about the papers listed above was the knowledge in all of them that water vapor in the stratosphere had a significant effect and also that the observations of stratospheric water vapor were very lacking. In that sense the Solomon paper from 2010 isn’t anything “revelatory”. But there is also the problem that knowledge of stratospheric water vapor prior to the 1990s will probably stay as largely guesswork. There’s much that is interesting in the Solomon paper and it will probably be the subject of a future article..
On your 30-second soundbite idea.. Probably ok as a soundbite. Not really. Because the same effect happens in the other direction. That is, CO2 absorbs longwave radiation no matter which direction it comes from. When I looked for deeper explanations, I was surprised by its complexity. Ramanathan has a number of papers which examine the radiative balance in the troposphere and stratosphere with various trace gases change. 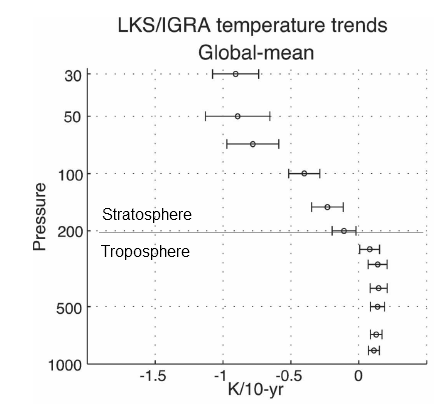 After a given change the new equilibrium radiative balance between troposphere and stratosphere (and within both of these regions) is not intuitively obvious (except perhaps to someone who has run 100s of model scenarios). So the point is, it’s not an easy subject to understand. It’s not easy to visualize. I accept Ramanathan’s “visualization” because he’s studied the subject for a long time and therefore probably right. But in this comment he’s more just trying to help people visualize than really explaining the effect. But i will reread this and follow the links, it is something id like to “get”. It’s not an easy paper but there are a lot of useful insights even for a “casual” read..
oxygen from which ozone is made – why would it not be absorbing UV and making ozone? I must say, I had a strong negative reaction to reading this. Saying that something happens because that’s how it pops out of the math is a cop out, and not helpful. One should always use the math as a tool to understand the physics of what’s happening, and then give the physical mechanism. I like to start at this point: At any altitude, at steady state, you’ve got a balance. Greenhouse gases absorb radiation, thus increasing the thermal content of that local layer. Yet they also emit radiation. Changing the local composition of greenhouse gas will somehow affect this balance, and lead to either warming or cooling. To sort out which happens at any given altitude, you have to do work out the math, with at least a 1-D vertical model. But the results of the math can be understood in terms of this balance, and how it shifts. That last link o science o dooms goes into it a bit(basically O3 is a “greenhouse” absorber (of UV), where as breakdown o O2 is endothermic?… but it dosnt really go into variable solar UV, which from that last link o mine seems to be implied to vary up to an order o magnitude during solar minimums…. Hmmmm….. I think this may be an area that needs further investigation. You have to compare the relative rates of ozone production and destruction. If you increase the rate of destruction while leaving the production rate more or less unchanged, then you’ll have less ozone. Reactions have a systemic equilibrium, including the reverse path, so I was wondering about the intimate details where the certainty lies. I think I take my ScienceofDoom responsibilities seriously. The physical mechanism has been explained many times in many ways. It’s the absorption and re-emission of radiation by trace gases in the atmosphere. The point I am trying to make is that the truth or not of stratospheric cooling with increased CO2 isn’t dependent on our ability to come up with the right mental picture. We are considering a problem of integrating a complex function across 2 non-linear variables – the trace gas concentrations with height and the spectral emissivity/absorptivity with wavelength (which itself is a function of temperature, pressure etc). In creating a mental picture many people have stumbled at this point. Nice to see that Gavin Schmidt left up his failed attempts, for example. (As Alexandre noted earlier). CO2 Induced Stratospheric Cooling: A Clarification: It is well known that increased CO2 cools the stratosphere. The standard explanation given is that this cooling is due to the increase in the longwave emission to space by stratospheric CO2. In a fundamental sense this explanation is inadequate and possibly misleading (Prof David Rogers alerted me to this inadequacy: see Hartmann for a mathematically correct explanation). The magnitude as well as a the sign of the temperature change depends on the temperature profile. The great Ramanathan is saying it’s clear that it’s not clear. This is why less is made of stratospheric cooling in the polarized world we live in. 1999-2010 up and down for several reasons but average higher than 1978-1997 and essentially not varying in average. Most recent year high due to ENSO, but drop expected to follow from LaNino. Questionable where it will go from there. The point of all of this information is that even though CO2 had a steady and large increase over this entire period, nothing that happened seems to be related to the CO2. The TLS has been essentially constant since 1994, and this period included the largest increase in TLT. In fact, essentially all of the increase in TLT occurred after 1998. The fact that CO2 and water vapor may and probably do have some effect as stated ignores the possible mitigating effect of cloud change on the net result. My initial uneducated guess sounds so neat that I’m having trouble to let it go. Since energy emissions from the surface are getting trapped in the troposphere due to increasing GHG, less will reach the stratosphere – at least at first, while the imbalance lasts. Therefore, it should cool. A handful of experts say otherwise, and even have trouble explaining it conceptually. I can’t help concluding that my own guess is naïve and wrong, somehow. Could someone help me understand why? CO2 levels increase in the stratosphere as well. So you could say more heat should get trapped in the stratosphere, too. For the period of the imbalance, you would be right. Because you’re ignoring convection, we ought to take the ‘shells’ model of isothermal opaque layers of atmosphere. I’ll briefly explain before saying how a change in opacity will affect it. The outermost visible layer – a shell of gas just thick enough to be opaque – emits S units of radiation outwards, where S is the total solar input. But because radiation is omnidirectional, it must also emit S inwards. It’s emitting a total of 2S And in order not to change temperature (we’re working out what the equilibrium state is here) it has to receive 2S units of input, which it can only receive from the layer below. So that layer is emitting 2S upwards, 2S downwards, and hence 4S in total. The next layer down emits 3S up, 3S down, and so on. The power emitted increases linearly with optical depth, starting from a fixed point at the top. The temperature goes as the fourth root of the emitted power, and because atmospheric density is roughly exponential, the variation of temperature with height will be exponential, starting from the effective radiative temperature of the Earth at the top. Now, if you increase the opacity of the atmosphere, the opaque shells become thinner, you get more of them, the equilibrium exponential becomes steeper. It still starts at the same temperature on the outside, but the temperature rises ever more steeply as you descend, so the surface temperature will increase rapidly. Note that all of the atmosphere warms. But this is the equilibrium state. If you suddenly increase the opacity without changing the temperature, it will take a non-zero time to approach the equilibrium. Suddenly all but the top layer are too cool to support the heat input to the layers above. The heat will flow out, they will all cool, and the top layer will no longer be outputting S units. You quickly get an exponential of the right steepness but the wrong starting point. Now the heat at the surface builds up, raising the temperature once again, filling the atmosphere up with heat starting from the bottom. The surface has to heat the bottom layers before they can in turn heat the upper layers. The real atmosphere doesn’t work like that. First, as soon as the temperature gradient exceeds a certain limit (called the adiabatic lapse rate) it becomes unstable and starts to convect, carrying heat away from the surface faster than radiation alone. So you can never get such a build-up of heat at the surface as pure radiative physics would predict. Secondly, because upper atmosphere ozone absorbs UV, the temperature rises with altitude in the stratosphere – which messes up the nice picture of each layer below supplying the heat to the one above. Instead, the layers above are radiating heat downwards to the cooler layers below, from which most of the radiation to space is taking place. Understanding the real atmosphere is harder, and I won’t confuse you any further by trying to explain my slightly different way of looking at it. Besides which, this answer is probably too long already. I liked your answer, that you took the time to post it and that you were inspired to do the million steps that got you the understanding and ability. Mostly, even though I’m not nearly so inspired to do that same work, I love thinking. And life is a positive sum game whenever people who reason can thrive. Dave, Thank you! It’s really nice to be appreciated. I mostly do it because I enjoy it – it’s a good way to relax after a hard day at work. I also find it useful to sharpen my own understanding – they do say that to really learn a subject the best way is to teach it. And I regard it as a vital part of the scientific process: – to expose my beliefs to the best possible arguments against them, from people both motivated and expert enough to find anything wrong with them – as a way of justifying that belief. But it’s also good to watch when someone else experiences that Aha! moment of understanding. It doesn’t always happen (especially on this topic) but it really feels great when it does. 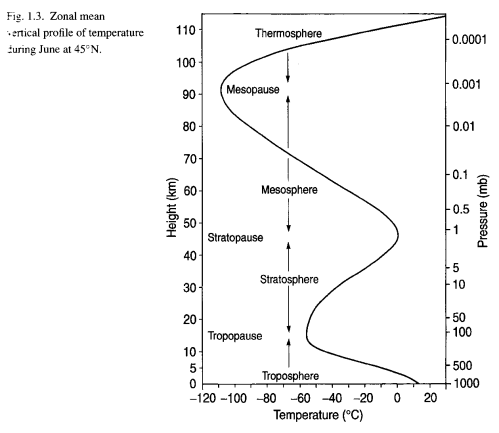 This temperature profile of a cooler stratosphere is the equilibrium state? That really doesn’t seem to fit in my mental picture – maybe that’s the flaw, after all. I might do another post with a few more temperature reconstructions, especially by year, rather than the ‘C/decade by pressure/altitude. 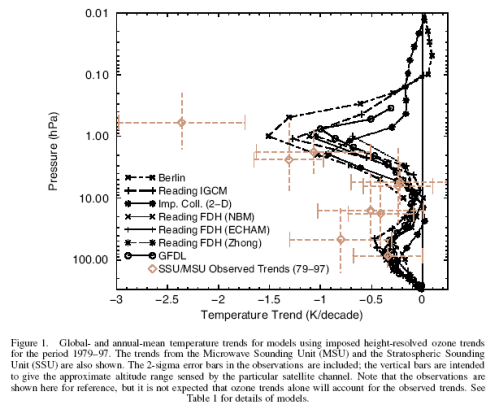 There are a lot of issues (questions) with all of the temperature reconstructions. But, more importantly, two points to think about. First, radiative equilibrium in the stratosphere is relatively quick compared to the surface/troposphere. In the lower stratosphere we might be talking about 2-3 months and in the upper stratosphere we might be talking about days for the system to reach equilibrium from a change in CO2 or other trace gas. But that doesn’t mean that anyone expects a monotonic change in stratospheric temperature with CO2, because (once again) many other factors are also changing. We have ozone changes which are poorly understood and also a much stronger function of latitude and season. And we also have the radiative equilibrium with the troposphere. The troposphere takes much longer to reach “equilibrium” (if it ever does). The point is that the stratosphere affects the troposphere and the troposphere affects the stratosphere. On top of that we have the effect of stratospheric water vapor – many effects unknown because the amount and changes of water vapor are not known ; and the 11-year cycle of solar radiation superimposed along with volcanic eruptions. It’s not a nice simple relationship. However, the fact the relationships are complex doesn’t mean we can just ignore them and say “oh this is CO2, and never mind the complexities”.. However, other effects could possibly also cause stratospheric cooling at the same time as tropospheric and surface heating. It’s a complex subject. But something to question for those other potential causes – would they also cause stratospheric cooling? -Is this cooling the result of increased CO2? aren’t so easy to answer definitively. Model results for 40 years predicted a stratospheric cooling with more CO2. We do appear to have some stratospheric cooling, but not a steady decline. If other causes of the warming over the last 40 years are also consistent with the same poorly understood stratospheric cooling then they will be equal candidates for attribution of temperature changes. Would cloud changes (less cloud) cause stratospheric cooling as well as surface warming? The upper troposphere and stratosphere cooling is not only not monotonic, it is specifically occurring in steps immediately following large volcanic eruptions that also had large effects on the temperature. This seems like reasonable cause and effect, although the cause of the drop following the heat spike is not known. In addition, many measurements made before satellites and since support the fact that the absolute water vapor content at higher altitudes went up a bit in the 1990’s up to just past 2000, then down a bit. The relative humidity went down most of that time. This is in direct disagreement with model assumptions, although the accuracy of the many of the data sets is in question. Since the direct CO2 lower atmospheric heating and stratosphere cooling are not a large effect with out positive feedback, feedback is the issue. I would think more clouds, not less, would cause the observed stratospheric cooling, but it depends on what type and where the clouds are. In addition, long term ocean currents and aerosols are still not fully understood. I want to take this time to thank you for the detailed analysis and explanations you give on parts of the science relating to this subject. Your clear and detailed presentation is a pleasure to read, and has improved my understanding on some points. You have made clear this is a complex subject, and not fully solved, so piecewise conclusions do not necessarily prove either side of the issue of CAGW and AGW as being wrong overall. You just try to show why some statements made are incorrect, and what are the facts as best understood. This material would make a good book on the subject. Have you considered making one? A quick Q on the modeling of tropospheric temps, is the UV considered to be a relatively constant factor? I haven’t seen any mention of it in what i have read. And also would electromagnetic excitation o upper atmosphere also possibly be a factor? (i know im thinking o it very simply, domino effect) Maybe inconsequential, but energy is energy? Oh… stratospheric… not tropospheric, missed that. I’ve read your article a second time and gone and done some research on photons and photon absorbtion. Unfortunately I’ve not had not much luck in understanding the underlying processes involved. Now the problem I have is the whole photon absorbtion / temperature change thing. My basic quantum physics education says that photon absorbtion is quantised and results in a change in energy levels of some electron in an atom. I also understand that this does not change the temperature of the atom involved. What is the situation with a gaseous CO2 molecule absorbing a photon? What temperature change happens and how does it happen? How does the reference above to decrease of OLR with temperature work with the basic QM absorbtion and emission of photons? I realise this is probably not your field – nor mine – but I’d really like to know the answers so I can understand the papers you have referenced. This subject got “semi-discussed” in How Much Work Can One Molecule Do? The standard works just state that the transfer of energy takes place via collision – with no qualifications. When a molecule which has been excited to a higher energy state (whether vibrational or rotational) experiences a collision (or the right kind of collision) the energy must be transferred into kinetic energy without a photon emission. Otherwise the process would be that the molecule returned to its original energy state via re-emission of exactly the same wavelength photon as it originally received. And there would be no thermal effect on the atmosphere. I feel as though I should write a post on this subject so we at least have a reference. But it’s a very in-depth subject and not one I feel that I understand well enough to write about. I have consulted several works which all treat it by just mentioning it, including one which went into huge depth on quantum mechanics. And this work still just commented that collisions convert vibrational/rotational energy into kinetic energy (=thermal energy) of the colliding molecule. So I will see what I can cover in a new post on the subject. A quick Q on the modeling of stratospheric temps, is the UV considered to be a relatively constant factor? I haven’t seen any mention of it in what i have read. UV is just a proportion of solar radiation. Most UV is absorbed before it reaches the troposphere by O2 and O3. And also would electromagnetic excitation of upper atmosphere also possibly be a factor? (i know im thinking o it very simply, domino effect) Maybe inconsequential, but energy is energy? Not sure. There isn’t much energy above the stratopause because the atmosphere is so thin, so it’s hard to see that it could have much effect – but then it’s surprising to see the stratosphere having so much effect on the surface/troposphere. And this work still just commented that collisions convert vibrational/rotational energy into kinetic energy (=thermal energy) of the colliding molecule. This is what causes me problems. I’m sure there is a good explanation, but I have no education / research that shows how QM energy levels can be converted into molecular kinetic energy other than via chemical processes – and then there is doubt about the final resultant of chemical change + energy. So some explanation about how radiation energy at specific frequencies affects gaseous molecules would be good. An explanation about how frequencies that are not matched to CO2 energy transitions are absorbed and what happens to the excess energy would be very good. I again realise that this is probably not your forte,but these processes are critical to understanding the many paper about. Thanks for the kind comments. One day I might write the book. When I feel I understand the subject.. I would think more clouds, not less, would cause the observed stratospheric cooling, but it depends on what type and where the clouds are. In addition, long term ocean currents and aerosols are still not fully understood. If more clouds cause a solar reflection increase then this is the same as a solar reduction and should cause surface/tropospheric cooling + stratospheric cooling. If less clouds cause a solar reflection decrease then this is the same as a solar increase and should cause surface/tropospheric warming + stratospheric warming. That is, one effect of clouds (reflection) is to pull surface and stratospheric temperature changes in the same direction. But clouds and aerosols are complex. I can’t say that there are no other reasons for stratospheric cooling. One approach would be to say that ozone changes cause the observed changes in stratospheric temperatures and “natural variation” in e.g. clouds have caused surface temperature changes in an opposite direction. It’s as if many people are treating CO2 in a different way from other possible climate effects – the burden of proof generally seems much higher. Let’s try and forget about all of the politics and “baggage” that is associated with CO2.. The effect of more clouds during the day does reduce the Solar insolation. However, it also increases the “trapped” energy due to blocking the outgoing radiation. At night, extra clouds clearly increase the relative ground and lower atmosphere temperatures by blocking outgoing radiation. The net is that less energy reaches the ground, but the average temperature can be higher. A quick test is to compare how the day and night temperatures compare to past history. The global increase in temperature has been shown to occur mainly by higher minimum ground and near ground temperatures rather than higher maximum temperatures. This is exactly what would be expected if increased cloudiness is the cause. The lower high altitude temperature would also be caused by the same effect. It would only take a few percent change to cause the measured effects, and the time the clouds form and fade is also more important than total quantity. Clouds have a net cooling effect. They reflect solar energy (cool) and increase downward longwave radiation (warm). The net global annual average is -18W/m^2 measured by ERBE. You are right that small changes in clouds can have measurable surface temperature effects. But clouds are a complex subject and something I hope to write about soon. If I do, we will have the opportunity to look at clouds in some more detail. Clouds in Sunlight have a cooling effect, but at night a warming effect. The average daytime cloud cover may in fact be slightly decreased to constant, but the night time clouds increased. This would do as I stated. Ohh its not a paper its an article(nasa one) and i meant the paper you linked to in comments, seemed to point to UV being a considerable factor in the upper atmosphere. Not in comments in the paper claiming UV was a considerable factor. UV is a major factor in the stratosphere – it is the highest energy UV that is absorbed by O2, which break up into atomic oxygen and finally form O3. Lower energy UV is absorbed by O3. Consequently we get very little UV reaching the surface which is a good thing. By the way, the energy of a photon is proportional to its frequency, inversely proportional to its wavelength, therefore the lowest wavelength radiation has the highest energy and it is this high energy which can disassociate molecular oxygen into atomic oxygen. Without this absorption in the stratosphere it wouldn’t have the temperature profile it does, it would instead cool from bottom to top. Above the stratosphere? I haven’t looked at this. Very cool video. I’ll try that at home, my son should love it. I think there’s a typo at the top: 300ºK below solidification temperature? Naw- they were talking about a gold/silicon alloy that melts lower than 1000C or something. They just found out why it is a low temp liquid alloy now and that may explain supercooling in all its forms. Did you ever make a cloud chamber? It’s neat to watch energetic particles at work. I wonder if anybody ever made a snow chamber? I guess stratospheric cooling is not a trivial feature. I have searched many other explanations. Scienceofdoom says it’s all in the maths and I’m 99.9% sure he is right, but I’m still looking for the field geologist explaination (the one that can be understood by 5th-graders). Therefore, all other things being equal, if RO-troposphere increases, the RO from other atmospheric “shells” has to decrease. Is this anyway near correct, at least conceptually? Climate models predict that if greenhouse gases are to blame for heating at the surface, compensating cooling must occur in the upper atmosphere. This is bordering on misleading – as “compensating” is not the right explanation. If the “explanation” left that word out, it would be an accurate description (and not an explanation). Most of the radiation out of the earth’s climate system occurs from within the troposphere – this is the balancing item for incoming solar radiation. As greenhouse gases build up within the atmosphere, this radiation out of the climate system occurs from higher up within the troposphere. See, for explanation: The Earth’s Energy Budget – Part Three. Radiation from higher up means radiation from a colder atmosphere, so there will be an imbalance (less radiation out) – resulting in a warming of the troposphere. This doesn’t explain why the stratosphere will cool. As the troposphere comes back into equilibrium it will be radiating out the same amount of energy as before. Out of all of the conceptual explanations I have seen, I am most inclined to believe the one from the great Ramanathan (in the article). Note: the concept of equilibrium is a useful one to consider the “before” and “after” – i.e., how changes cause immediate and longer term effects – but doesn’t necessarily mean that any part of the climate system is currently in equilibrium, or ever really in equilibrium. The first one I had seen but it’s not really about stratospheric cooling. The thermosphere has little radiative effect on the stratosphere or the troposphere because the pressure is so low (and therefore almost no heat capacity). The 2nd article I hadn’t seen but it looks like an opus with lots of questionable claims. But I haven’t read it in detail. The problem as described in the Fu paper is to try and improve the tropospheric temperatures by removing the stratospheric contribution. So it’s not about the problem of determining stratospheric temperatures. 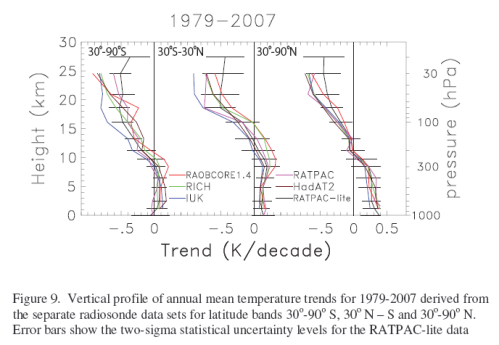 However, for other reasons determining stratospheric temperatures is not so simple – prior to 1978 it is a problem because no satellites and after 1978 there is better coverage from satellites but still problems with vertical resolution as the radiosonde contribution is limited. But I will post on the last article when I have finished reading the paper by Fu in Nature.. watch this space. Link and Quote failure: a Wunderground page on stratospheric cooling, etc. Does your filter rip out links and foreign text blocks from responses? No it doesn’t rip out links – I noticed when you posted the comment that the link was missing. When you put the tags in you didn’t put in any text. I re-arranged to make the link work. You can either just paste the link, or if you use a href=.. you need to include the text for the link before the final /a. SoD, Thanks very much. I need to get a few of those papers and have a go. The words aren’t doing it for me, so it’s time to get out of the grocery store. Equilibrium is nice, like zero and infinity, it lets you isolate your critical parameters to what you think you know well. The climate wants to equilibrate, but can never get there. The concept of equilibrium and how it changes opens up quite a large topic. Spurred by a desire to produce a “true” tropospheric-only temperature dataset, Spencer and Christy extensively examined various methodologies, including one like Fu et al. describe, in the late 1980s and early 1990s. Spencer and Christy quickly realized that such a technique was infeasible because it produced a situation that violated some basic laws of physics—namely, that energy must be positive (Figure 2). I searched the 2 cited papers: Christy and Norris (GRL 2004); and Spencer and Christy (Science 1990) but couldn’t find anything which backed this claim up. I also checked the citation from Fu of another paper by Spencer and Christy from 1992 without finding anything to back up the idea that Christy and Spencer had “examined and discarded” this method. I read the paper by Fu. It certainly seems reasonable, perhaps the “review process” is better at Nature than at worldclimatereport.com? That’s not to say that Fu’s method is better than Christy’s method for determining the real tropospheric temperatures. But I can’t see the basic flaw that the worldclimatereport.com article suggests. Stratospheric temperatures do affect the measurements in MSU 2. Therefore, if there is a trend in the stratosphere which is significantly different from the trend in the troposphere it will affect the reading. It seems ok to subtract this MSU 4 (stratospheric) trend – appropriately weighted – to find the real tropospheric temperature trends. The effective weighting function may have a negative part [Spencer and Christy 1992] ; this is different from the physical weighting function, which must be positive everywhere. I think that the writer at worldclimatereport.com is probably in error. If not, it would be nice to see where Spencer and Christy have “examined and then discarded” this method. Douglass and Christy were blogged to death at RC and associated sites and supported at CA etc; I don’t know of a peer reviewed paper which has come out in response to D&C but their paper does seem to establish a contradiction with Fu because the Stratospheric cooling seems to be the flip side of the THS. I’m having trouble posting this so if any duplication occurs sorry. My point is while Spencer and Christy have not specifically addressed Fu the Douglass et al paper does indirectly, at least in respect of the troposphere. I’m sure there are lots of different ideas about how best to interpret the satellite dataset. And I don’t know who’s right. But the worldclimatereport.com article doesn’t seem like a contribution to the debate. However, the tropical hot spot is of interest and I promised a few other people I would get around to posting on it soon. I am really excited to see people taking an interest in the stratosphere. The story is in fact complex. Between 1948 and about 1980 the mid and high latitudes of the southern hemisphere stratosphere and upper troposphere warmed very strongly. These same latitudes cooled thereafter. In recent times parts of the stratosphere have begun to warm. I see very little acknowledgment in the literature that stratospheric temperature is driven by the absorption by ozone of long wave radiation from the Earth. The Earth loses cloud in mid year as the land masses of the northern hemisphere heat the troposphere. This causes the annual peak of temperature in the stratosphere to appear in August right through the northern hemisphere and the effect is felt as far south as about 35°South. So, stratospheric temperature also depends upon the radiation from the Earth. If the Earth is radiating more energy it can only be due to the absorption of more energy. For the Earth to absorb more energy, more must reach the surface. This occurs when less radiation is reflected by the atmosphere. So, the Earths temperature very much depends upon atmospheric cloud and aerosol content. It is my my belief that we should begin our discussions of climate with observations. It provides the necessary grounding. “The small amount of negative area under the channel 2R averaging kernel in Fig. 4, although probably insignificant in comparison to uncertainties in oxygen absorption theory, would lead to a minuscule warming in the channel 2R Tb if stratospheric cooling occurs, and vice versa. So the authors are not, as Fu suggests, saying that negative weights are acceptable; they are merely saying the amount of negative weight in their example is so small that its ill-effect is probably insignificant relative to other uncertainties. I agree that the 1992 paper doesn’t “endorse” the method. However, the original worldclimatereport.com article that was referenced implied that Spencer and Christy found the idea to be flawed. But I find no mention of that. And the method by Fu seems uncontroversial. If two layers of the atmosphere combine to give a result than if you can find a way to subtract the effect of one of the layers you will get the net result of the other layer. That doesn’t mean it’s better than Spencer and Christy’s method. Fu didn’t find a way to subtract the effect of one layer from another. There is no way to do so using the satellite channels he used. If there were a way, it would give a near zero weight for the unwanted layer. This is actually what Spencer and Christy were attempting in their paper, using different channels. What Fu did is calculate a purely statistical adjustment with no physical basis. The overlap between T_2 and T_4 is largely immaterial. Suppose instead, T_2 was the unweighted average from 100 to 1000 hPa and T_4 was the unweighted average from 30 to 100 hPa. There’s every reason to expect that a linear regression would produce similar results, even though there’s no overlap between these hypothetical T_2 and T_4 channels. Considering that the actual T_2 weighting function has a significant contributions from 200 to 300 hPa and from 850 to 1000 hPa, while the T_4 weighting function has little contribution from the first region and none from the second, the hypothetical case is not far removed from the actual case. No one can seriously contend that there is some combination of T_2 and T_4 that will remove the contributions to T_850-300 from these two regions. I think it’s clear from their comment that Spencer and Christy do find the idea of using a negative weight to be flawed. The comment seems to me to say the negative weight is a problem which could result in false warming or cooling, but for the particular weighting function under consideration, the negative area is so small that the error is down in the noise. In contrast, the negative area for Fu’s weighting function is large, and if the stratospheric cooling hadn’t produced a non-minuscule rise in the lower tropospheric temperature, there would have been no reason to publish the paper. Energy leaving the atmosphere to Space can only be radiated. The only molecules which can radiate significant amounts of energy at the temperatures in the atmosphere, are the GHG molecules, primarily H2O, CO2, with others (ignored in the discussion). A water molecule minding its own business gets collided with by other molecules at a very high rate (10^10 per second). Sometimes it will gain sufficient energy to be able to emit a photon at one of its preferred frequencies, but only rarely (about one chance in a million) will it have time to do so before another collision robs it of the energy again. If it does emit a photon in a spacewards direction, the photon will be liable to absorption by any of the water molecules it encounters on its way to space. Obviously the lower in the atmosphere, the more chance there is of the photon not making it. So the majority of emissions to Space from water vapour are coming from the “top” of the water vapour in the atmosphere, somewhere at the cloud tops. The net effect is that there might (I doubt it) be a small heating of the Troposphere and a small cooling of the Stratosphere, tending to raise the height of the Tropopause. This is calculated to cause a 3.7W/m^2 change in “radiative forcing”(terrible term!) for a doubling of CO2, but the translation of that to any degree of warming at the SURFACE is quite unclear to me. The Surface is very insensitive to changes in “forcing”, and I don’t buy the “Constant Lapse Rate” explanation as yet. The translation into any warming effect depends on all of the other factors in climate. But first of all, clarifying individual effects is the most important step. The “constant lapse rate” explanation is a simplification to help understand the subject conceptually. However, my comment here doesn’t mean that the lapse rate isn’t important as a factor in determining the surface temperature – but the lapse rate will also depend on the humidity which depends on many other factors. “The translation into any warming effect depends on all of the other factors in climate. 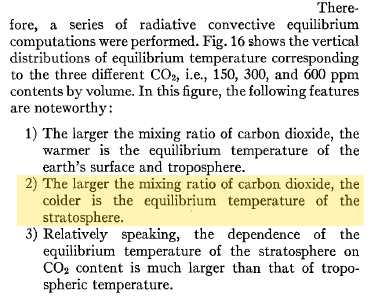 My problem is with IPCC AR4 WG1 Chapter 2 Figure 2.2, which implies that a temperature change at the thin cold upper Troposphere translates to exactly the same temperature change at the hot dense Surface. Thermodynamically the ONLY way the Surface temperature can change is if the “forcing” changes. There are only two components of “forcing” – Absorbed Solar Radiation, and IR Back Radiation. Using the KT diagram numbers, the sensitivity of the surface to a change in forcing lies between 0.095 and 0.15DegC/W/m^2. The lower number is for evaporation increase of 6.5%/DegC, the higher for 2%/DegC. A doubling of CO2 is claimed to lead to an increase in “Radiative Forcing” at the base of the Tropopause of 4W/m^2, leading it is claimed to an increase in temperature there of 1DegC. If the Surface was to heat up by 1 DegC, the additional forcing required would be between 7 and 11W/m^2. I think you maybe misunderstand the intent and claims of this figure (and section). It’s not the “complete and full climate response to a change in ‘greenhouse’ gases” – it’s trying to contrast the various ideas about the meaning of “radiative forcing”. Looking back in the literature many slightly different comparison scenarios were created as a result of doubling CO2. I touched on this issue in CO2 – An Insignificant Trace Gas? Part Seven, and, therefore, it’s important to understand what the different ideas mean and why they are different. And I’ll try and take a look at your other questions in the next day or so.. I must thank Science_Of_Doom for his honesty, and his efforts in opening up discussion on the physics of the Greenhouse, and his patience in dealing with people (like me) who don’t understand (and therefore don’t accept) what the hypothesis is. I think this site goes some way down the track of explaining the Greenhouse hypothesis, and that the IPCC should have done, and should be doing, more in this area. Onto your question from earlier.. There are only two components of “forcing” – Absorbed Solar Radiation, and IR Back Radiation. Using the KT diagram numbers, the sensitivity of the surface to a change in forcing lies between 0.095 and 0.15DegC/W/m^2. The lower number is for evaporation increase of 6.5%/DegC, the higher for 2%/DegC. “Onto your question from earlier.. 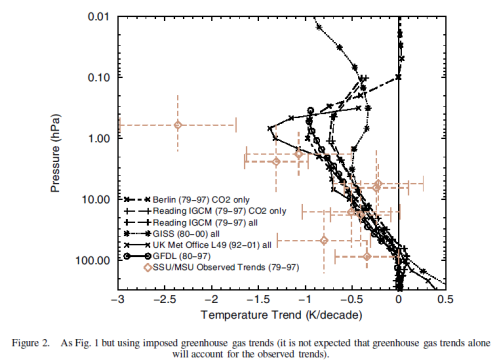 I use the K&T diagram from their 1997 paper, which is the one published in IPCC AR4 WG1 Chapter 1. Similar calculations can be done with later verdions of their diagram. Figures in brackets are W/m^2. d(Evaporation) is unknown but believed to be in the range 2 to 6.5% per degC. d(Conduction) I assume to be zero, as in the steady state there is no obvious reason why conduction should be any different at a higher temperature of the system – we still expect the same differential between the air and the surface. 2. Evaporation is an additional, and very strong, surface process. In my previous posting I did not make clear that the balance formula really only applies at equilibrium, after all change has taken place. So if we calculate the change from an (equilibrium) 15DegC surface to an (equilibrium) 18DegC surface, we will arrive at the change in Forcing required to MAINTAIN the system in its new equilibrium state. (I chose 18DegC, because the change in temperature of 3 DegC is the IPCC median guess). It turns out that the change in Surface Forcing required to maintain the new higher temperature is between 20 and 32 W/m^2. Thanks for the explanation. What that’s telling me is that the sensitivity calculations don’t really come from Trenberth and Kiehl – expect for the existing values of global annual average W/m^2 for each “process”. So we need to look elsewhere for the values of sensitivity. I hope to get to an article on this in a little while. Very nice website. As with all scientific disciplines first you have to learn the language they speak before you can take on the ideas. It’s great to have this sort of website for doing that. Now the brown nosing is over I’ve got a question that the article and some of the replies have raised. I started to wonder what happens in the stratosphere during a large El Nino, such as 1998. Leonard Weinstein April 19, 2010 at 1:52 pm linked to a time series of troposphere and stratosphere temperatures. These records show the stratosphere reacts to volcanic eruptions by heating, I guess this is the energy that doesn’t make it through the aerosols and gets trapped/reflected back to the stratosphere. But I don’t understand what is happening during the El Nino. My understanding of El Nino is that a large amount of energy is released from the ocean to warm the atmosphere. It appears to do this to the troposphere but doesn’t seem to make it to the stratosphere. Does anybody have an explanation for why this happens? Does anybody have an explanation for why this happens? It’s a very interesting question, and one I hope to try and explain when I have had the chance to think about it. Watch this space.. and, if no response try reminders from time to time. I don’t know if I can post images, here goes! These might help. I looked at the satellite data for the Lower Troposhere and Stratosphere. It’s remarkable how on a local level the temperature anomolies are the reverse of each other at the different atmospheric levels. This must be clouds not well mixed GHGs I guess. I just show Dec 2009 here which is the early part of the most recent El Nino. I choose it because it’s the most clear, 1997/1998 looks similar. Is this an artifact of the measurement process. This was in response to a calculation of the Surface sensitivity to W/m^2 changes (see my post at 1212, 9MAY10) . I don’t agree entirely with “the sensitivity calculations don’t really come from Trenberth and Kiehl “, while it is sort of true, the key number used in my calculation is their value of evaporation at 15DegC. Is the calculation invalid, and if so, why? What a pleasant surprise! I was expecting to see the usual claim that stratospheric cooling proves that surface warming is caused by increasing GHGs and wondering how you would reconcile the absence of a clear “hot spot” in the upper tropical troposphere (where the data supposedly isn’t “reliable enough” to prove the hot spot is “missing”) with the presence of a cooler stratosphere (where poorer data and the ozone depletion make it difficult to draw any conclusion). I was delighted to see that you didn’t think it was appropriate to draw any strong conclusion about the role of GHG’s based on the existence of stratospheric cooling. The logic in your discussion of attribution, however, appears faulty. You say: “Global temperatures have increased over the last 40 years and many people want to understand the cause. If solar heating was the direct cause (see Here Comes the Sun), the stratosphere would not be cooling.” With equal validity, one could say: If CO2 was the direct cause, the stratosphere would not show the observed pattern of cooling with altitude. Both statements are wrong because neither the hypothetical solar heating nor the hypothetical GHG heating are occurring in isolation. Changes in ozone (and possibly other factors) interfere with our ability to attribute surface warming to either solar heating OR GHG accumulation based on stratospheric cooling. If ozone depletion were large enough, stratospheric cooling would be observed with surface warming caused by any mechanism. Temperature is a measurement of the translational Kinetic Energy of the particles. CO2 and other particles collide with each other and some of this translational Kinetic Energy is converted to vibrational Kinetic Energy of the CO2 particles. At this point, the temperature is lower. Nature prefers a lower energy state and the excited CO2 molecules give up the vibrational Kinetic Energy by returning to the unexcited ground state. In so doing they give off Infrared radiation. In the rarefied atmosphere of the stratosphere, this radiation does not impinge on stratospheric particles and simply escapes into space. The more CO2 that you have in the stratosphere, the more collisions of CO2 molecules, the more excitation and deexcitation of the particles and the lower the temperature. For the last 16 years, the stratospheric temperatures has been on a slight (and statistically insignificant) warming trend. This trend causes problems for the CAGW theory, but perhaps someone may want to try to explain this trend based on the Montreal Protocol. If the Protocol reduce ozone-destroying chemicals, then the stratsophere temperatures could increase as those chemicals are phased out. The most plausible theory for stratospheric temperature trends that I have heard. Volcanoes in mid latititudes cause an quick spike in stratopheric temperatures, followed immediately by the sulfate aerosols destroying ozone — causing a quick drop. (Thus explaining the step function decreases that we have observed in stratospheric temperatures.) Then the ozone gradually rebuilts, slowly pulling the temperature up with it. Thus explaining the slow increase that we have had in the last 16 years since the last mid-latitude major volcanic eruption. c) a net increase in the rate of global warming? I find it useful to think in terms of the mean free path of a photon. CO2 has a certain radiation cross-section [yes it really has the units of area] at the relevant wavelengths. That is the effective area of the molecule “blocking” the free passage of the photon. Let us call this area, A. If there are n molecules per unit volume, on average, the photon will travel a distance, d, such that n*A*d = 1 before it is stopped. so d = 1/ (n*A). Now, of course, the molecule will re-radiate at an average rate dependent the local temperature. If there is to be a net flow of radiation, there must be a gradient in temperature and/or density of radiating molecules. Below about 80 kM, the density, n, is relatively high in the sense that d is short enough so that n is almost constant over that distance. This leads to a counter-intuitive conclusion that the effective “thermal conductivity” due to radiation is independent of the density n at high densities, [i.e. below about 80 kM]. Adding CO2 here makes little difference to the energy flow. But as the density drops, the mean free path increases to the point where the change in gravitational potential energy of that distance implies a significant drop in density. Now the radiation increasingly escapes into space – cooling effect. I think this is the cause of the mesopause temperature minimum. Adding CO2 here will raise the altitude at which it happens and so alters the balance between heating [O3 absorption of UV] and cooling [I.R. radiation by O3 and CO2 etc.] at that higher altitude. The net energy flux carried by photons is not independent of the density of the gas at high densities but the smaller the higher the density. We may assume that the temperature depends linearly on the height over the range we need to consider. In this situation the total amount of photons moving up or down is close to the value given by Planck formula and thus almost independent of the density. There are more photons going up than going down, because temperature decreases with height. This difference is the larger the larger the mean free path is, because a larger mean free path means that the photons come (on the average) from a location, whose temperature differs more from that at the point of observation. From this argument we can see that the “radiative thermal conductivity” is proportional to the mean free path, and thus the lower the larger the density of molecules. What I left out was that the number of photons departing a given level is also proportional to the density of radiators, n. So, putting it together, the net flux, J, is proportional to n and delta T. But delta T is proportional to d which is inversely proportional to n. Whence we see that the flux is independent of the density, n.
Of course, this cannot proceed indefinitely. At some point, m*g*d ~ kT, where m is the molecular mass, g is the acceleration due to gravity, k is Boltzmann’s constant and T is the absolute temperature. Now n starts falling off significantly between collisions the net flux can proceed even against a temperature gradient. The number of photons emitted and absorbed in a volume is proportional to the density of molecules, but the intensity of radiation is not. Independently of the density there are essentially as many photons crossing the level when both directions are added up, they only originate in a larger volume, which radiates less per unit of volume but as much when the larger size of the emitting volume is taken into account. Pekka, you are right. Thank you for the correction. I have been puzzling as to how significant energy can cross the tropopause. Obviously it does, but simple steady state reasoning on a single column of atmosphere must fail, because there is no temperature gradient to drive transport. Even worse, the stratosphere has an adverse gradient. 1. At night, how quickly does the stratosphere cool? 2. At the tropopause, how much of the vertical flux gets diverted horizontally towards the poles. 3. What does the vertical temperature structure look like above the poles – especially during the winter? You are right that simple reasoning tells that energy transfer between troposphere and stratosphere is very limited and occurs only by radiation. In reality the situation is not that stable leading to irregular energy transfer also by convection and turbulent mixing. I cannot, however, answer quantitatively your two first questions. On the third question this figure from the book Washington and Parkinson: An Introduction to Three-Dimensional Climate Modeling gives an answer. Thank you, Pekka. The graph is very helpful. The polar winter profile is as I suspected – temperature continuing to decrease with height with barely a pause at 10 km. I would be willing to bet that this is a significant route for heat to reach the upper atmosphere by both radiation and convection. I conjecture that heat in the convective mode at low latitudes, and that rising air will get bent over into horizontal flows, some of which will go poleward, and escape via the polar route in winter. The question is, how much. A related question is how arctic surface warming affects the global flow of heat. I have long suspected that intra-year processes must be important in the energy budget, and we should be skeptical about steady state arguments based on annual averaging. 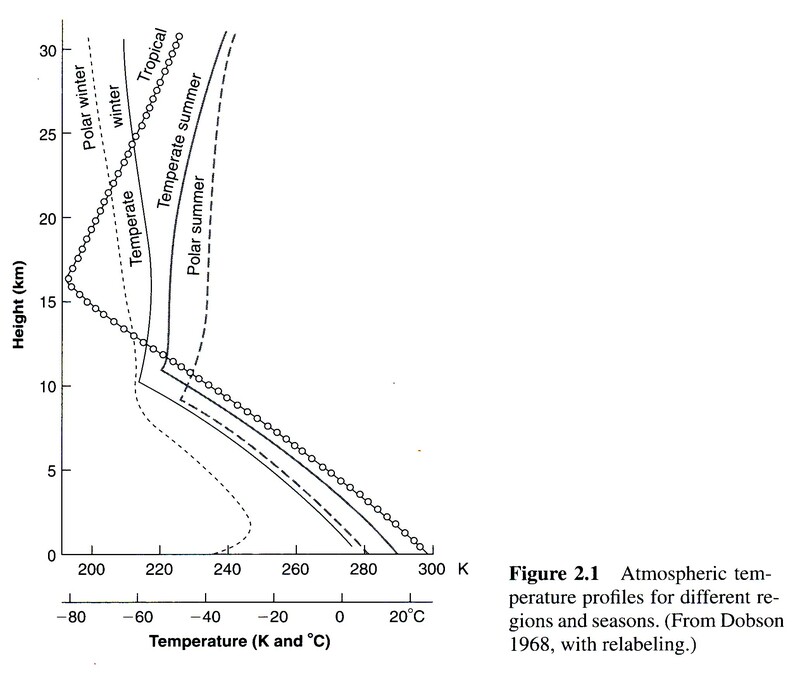 This figure from the book Pierrehumbert: Principles of Planetary Climate presents model results from a radiative convective model. Here we can see, how strongly the temperature drops even in the stratosphere, when the heating due to absorption of solar UV (mainly by ozone) is not included in the model. The real Earth atmosphere has a temperature minimum at tropopause wherever sun shines for a significant part of the day, because UV from the sun heats the stratosphere. Pierrehumbert places tropopause at the altitude, where convection stops in spite of the fact that temperature goes on falling rapidly even at higher altitudes. That’s the way I like to think about tropopause as well, but many people have different ideas on the meaning of the word. The empirical curve for polar winter has at all altitudes a lapse rate that makes the atmosphere stable and stratified. Such a profile cannot maintain any circulation by itself, but external forcing from lower latitudes can force some. Vertical flows must, however, be weak most of the time. Otherwise the lapse rate would be much closer to the dry adiabatic lapse rate (dry, because there’s so little moisture that the difference between dry and moist adiabat is very small). I see it. The polar winter slope is too steep to be convectively unstable. In the absence of UV heating, it must be determined by the IR flow. The slope above 10km is surprisingly constant. As you pointed out earlier, the radiative conductivity ought to go as 1/n. Could it be that O3 concentration is increases enough with altitude to compensate [since it too has an EM IR coupling]? There is another way that IR energy can flow net upward across the stratosphere: if the partial pressure of the radiators falls significantly over the photon’s mean free path, there will be net upward flow even against a temperature gradient. Obviously that can’t happen at the centre of the CO2 resonance. But off resonance is a different story. Re increasing CO2: it seems to me that the “action” is in the tropopause at the off-resonance frequency boundaries between optical density and transparency. As the density CO2 rises, the boundary moves further off resonance. There is going to be a competition between the increased number of radiating centres (a cooling effect) and the move further away from the resonance for energy “escape” [an insulating effect]. I think this makes a nonsense of “CO2” equivalents concept for the greenhouse effect of, say, CH4. One has to do a detailed analysis at every frequency, and only average over frequency at the very end. A flow of radiation – a form of heat – against a temperature gradient appears to be a violation of the 2LoT. Consider the radiative flux between two altitudes (z1 and z2) in an isothermal atmosphere. The flux of energy from z1 to z2 depends on: the density (d1) of GHG emitting at z1, the probability that a photon emitted upwards is not absorbed before it reaches z2, and the probability that an upward photon is absorbed by a GHG at z2 – which is proportional to the density (d2) of GHG at z2. The flux of energy from z2 to z1 depends on: the density (d2) of GHG emitting photons at z2, the probability that a photon emitted upwards is not absorbed before it reaches z1, and the probability that photon is absorbed by a GHG at z1 – which is proportional to the density (d1) of GHG at z1. The probability (p) of absorption along the path between the two altitudes is obviously the same in either direction. So the upward and downward fluxes are both proportional to d1*d2*p. Which makes sense – we expect no heat flow (net flux) in the absence of a temperature gradient. When the atmosphere isn’t isothermal and z1 is warmer than z2, each the GHG molecules at z1 will emit more photons per unit time than those at z2, which will lead to a net flux of photons (and heat transfer) from z1 to z2. Radiative heat flux through the atmosphere at any instant in time depends on the sum of the fluxes between all possible z1 and z2. This approach is useful for qualitative reasoning. For quantitative analysis, one numerically integrates how an existing flux of radiation is changed by absorption and emission as it passes an incremental distance through the atmosphere. Some caveats: The same absorption cross-section controls both the rate of both absorption and emission at a given wavelength, but the cross-section does vary modestly with temperature and pressure. Absorption depends on the intensity of the incoming radiation while emission is proportional to B(lamba,T) – but only if the atmosphere is in local thermodynamic equilibrium (LTE). LTE requires that collisional excitation and relaxation of the GHG being much faster than excitation and relaxation by emitting a photon. LTE exists for IR-absorbing GHGs in the earth’s atmosphere up to about up 100 km. (Above this, molecules no longer have a rigorously defined temperature – mean kinetic energy – so we can’t apply the 2LoT. Frank, you are forgetting about the pressure gradient. The 2nd Law of Thermodynamics is not limited to temperatures. If there are fewer radiators above than below, there will be a net upward flux. It is possible to recast the RTE to view the problem in the following way. Consider the flux of photons past any point. Where did any particular photon come from? It came from an excited molecule, and managed to avoid being absorbed in between. To avoid doing a full integration over all possible distances, we can approximate by assuming that the photon came from a mean free path away (this is what the integral would reduce to if the optical density were constant). If the pressure does not change much over a photon’s mean free path, then the the gradient in radiators can only come from the change in the proportion in an elevated state (i.e. temperature gradient). The situation you describe. But if the pressure drops significantly over the MFP, there are fewer radiating centres above than below. There will be a net upward flow of IR unless the temperature rises fast enough to increase the proportion of centres ready to radiate. As the pressure drops, the MFP will increase. At some point the MFP is long enough that the radiation can escape into space. Near the centre of the CO2 resonance you have to wait until 100 km before that happens, and, as you say, LTE becomes a questionable concept. Off resonance, however, the MFP is already long enough at the tropopause (10km) that some net IR radiation can cross the stratosphere in spite of the unfavourable temperature gradient. I do not know how big this effect is, but, without it net upward flux can only come from the temperature gradient, and all steady state arguments would say that net IR energy cannot cross the stratosphere. My conjecture is that the bulk the energy escapes across the stratosphere at the poles during the polar winter when the temperature gradient is favourable. Perhaps someone here can put a number on this effect. The 2nd law applies to the direct energy transfer between two volumes. This transfer is always from the warmer to the cooler volume. When the optical depth of a layer is not much larger than one, a significant fraction of the radiation from lower layer A that enters the upper layer B is not absorbed in it and does not contribute to the energy transfer into the layer. In the case described by David Barnett, the optical depth of the upper layer B is so small that that a large fraction of radiation from layer A below goes trough the layer unabsorbed. On the other hand the upper layer B also emits so little IR that the absorption of radiation from A remains larger than emission from B that gets absorbed in the lower layer A. Thus the net energy transfer between the two layers is from the warmer A to the cooler B independently on the altitude dependence of the partial pressure of the GHG considered..
David: I believe my d1*d2*p formula properly accounts for changes in the density of absorbers/emitters at different altitudes. d1*d2 is the same in both directions. Under LTE, the fraction of radiators in an excited state depends only on temperature, not pressure. B(lamba,T) is independent of pressure, but it is multiplied by density (d1 or d2) and cross-section to give.emission. You correctly note that there is a net upward flux of photons to space, but this is driven by a temperature gradient, not a pressure gradient. A steady state (not equilibrium) flux of energy from the sun flows through our atmosphere and surface by radiation and convection. As the MFP lengthens with altitude, the troposphere loses more energy than it gains by RTE and the difference provided by convection. No matter how tricky or complicated a system may be, the laws of thermodynamics provide a short-cut to predicting overall heat and energy fluxes. If you are violating the 2LoT, you must be doing something wrong – or you will get a Nobel Prize for solving the world’s need for energy. I am being sloppy when I say “pressure”. I am actually referring to your d, the density of radiator molecules. In the stratosphere, “d” diminishes with height under gravity according to the Boltzmann factor for each species (because there is hardly any turbulent mixing of the layers). What you say about the troposphere is correct. However, IR energy has to get from the tropopause to the mesopause against an unfavourable temperature gradient. Otherwise the troposphere would have to heat to much higher temperatures. I was pondering ways this could happen. In no way is the 2LoT violated. The stratosphere is out of equilibrium with radiation fluxes generated by gradients in the density of excited molecules. As you say, the fraction of excited molecules depends only on the Boltzmann factor. So the total density of excited emitters, at any height, is the product of “d” with B(lamda,T) and the radiative cross-section, sigma(lambda). It is the gradient in this product which drives the net flux. Because of absorption, the net flux is dominated by the region for which the photons are travelling ballistically (i.e. distances shorter than the mean free path). And the mean free path depends inversely on “d” and unexcited fraction. Consider any horizontal plane. What is the net flux through it? (This is posing the question differently from the one you were answering). Within a MFP of the plane, above and below, there will be a certain number of excited emitters. If the number below is greater than the number above, there is a net upward flux. While the MFP is short, the change in “d” is negligible and net flux can only be driven by temperature gradients. This is certainly the case at the centre of the CO2 resonance throughout the stratosphere. But at away from the resonance the sigma falls rapidly and so the MFP can lengthen to the point where “d” is much less above than below, and there can be a net radiative flux upward in the ballistic region. So I think we have been writing at each other at cross purposes. The radiative fluxes in stratosphere are dominated by radiation that passes trough the stratosphere without being absorbed or emitted even once. The stratosphere is transparent enough for most wavelengths of intense radiation and these wavelengths dominate the fluxes. Emission and absorption in the stratosphere causes only small corrections to these dominant fluxes. Hi Pekka. I think that is really my point, that this can happen even at IR frequencies, but not at the centre of the CO2 resonance. IR, of course, is what we are interest in for asking how increasing the concentration of CO2 will affect heat transport into space. IR at the centre of the CO2 resonance can’t have a net flux across the stratosphere because the MFP is small enough for the adverse temperature gradient to matter. But away from the resonance the photons can travel ballistically. There is going to be a wavelength where there is a transition from the diffusive to the ballistic regime. And that is where the action will be regarding IR transport and changes in CO2 concentration. Close to that transition there will be a fair number of radiators at the tropopause which can shed energy successfully to outer space. As CO2 concentration rises, the transition will have to move further from the resonance because the MFP will fall and the stratosphere will become optically dense at that wavelength. All this indicates that integration over wavelength must be done at the very end of the energy flux calculation. 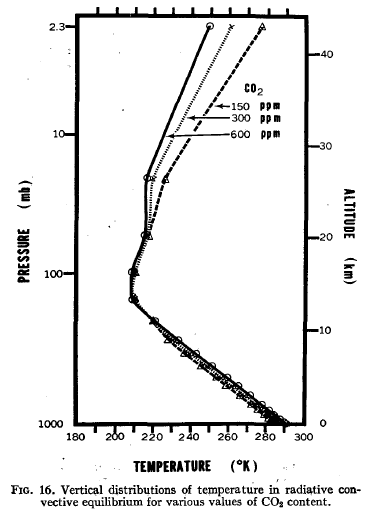 The question is, how much energy can the tropopause shed into space by this mechanism? And how does increasing CO2 affect this number? The stratosphere cannot affect strongly the troposphere, because lower stratosphere has a temperature close to that of the tropopause and the influence of the upper stratosphere is blocked by that lower stratosphere. There’s surely some influence, but it’s relatively weak. David: You can play with RT calculations using Modtran at the website below. Varying the altitude from which you look up or down can give you some idea of how total flux changes with altitude. You can even see a little bit of wavelength dependence in the spectrum. (Compare looking down from 70 km and 15 km and you can see the strongest CO2 line grow more intense from emission by CO2 in the warmer stratosphere and also emission from stratospheric O3. The superimposed blackbody curves give you an idea of the temperature/height photons escaping to space originate. B(lamba,T) is the Planck function, not a Boltzmann factor. (The Boltzmann factor is hiding inside.) The Modtran calculator is numerically integrating this equation. You are correct that the intensity at each wavelength needs to be tracked individually. I’ve been having a debate at ATTPs about the impact (or otherwise) of a putative “pause” in surface temperatures on the stratosphere. 1) The troposphere is dominated by convection. The boundary condition for the tropopause is the height at which radiation starts to dominate. This is expected to be set by radiative gases, notably CO2, and will stay at a constant emissivity and therefore absolute concentration (kmol/m3) of these gases. As the relative concentration (ppm) rises, the pressure for a given absolute concentration falls, so the height of the tropopause rises, but its temperature stays constant, maintaining heat balance as its emissivity stays constant too. Note that the absolute rise in height of the tropopause is very small, only 100m for a 1degC rise in surface temperature, a negligible proportion of the total height of the atmosphere. The stratosphere is entirely unaffected by the movement of the tropopause, other than starting a few metres higher in altitude. In the stratosphere, however, at any given height, there is a heat flux in, QS(abs) which is caused by the absorbance of UV by ozone primarily. There is also a heat flux out, QS(e) which is a function of temperature and emissivity at a given height. Emissivity is a function of C(CO2). Under rising CO2, QS(abs) remains constant, so QS(e) must also remain constant. But the emissivity has risen, as C(CO2) has risen, so the temperature must fall. Independent of events in the troposphere. If there is a “pause”, this “pause” may have many and varied causes. Ocean heat uptake may change, ultimately affecting convective heat transport. Solar forcing may change. Aerosol forcing may change. Measurements have errors associated. But the only factors which should change the stratospheric temperature are those that affect radiation in the stratosphere. If a “pause” were caused by solar forcing, the stratospheric temperature should fall as QS(abs) falls. But if nothing has changed in forcing agents other than CO2, the stratosphere should respond by cooling regardless of whether the surface has heated or not. Obviously this is far more simple than the reality, but I think it’s reasonable to 1st order. The stratosphere also responds very quickly relative to the troposphere. That’s why radiative forcing at the tropopause is calculated after allowing the stratosphere to reach a new steady state. The situation is a little more complicated. The earth receives an average of 342 W/m2 of SWR, but about 102 W/m2 is reflected. About 1/3 of the remaining 240 is absorbed at various levels in the atmosphere and 168 W/m2 reaches the surface. To maintain a stable temperature at all altitudes, a NET upward flux of heat (OLR-DLR + latent and simple heat) equal to downward flux of SWR at that altitude is needed – a value between 168 and 240 W/m2. At altitudes where the atmosphere is too opaque for the necessary amount of heat to escape upwards, the difference is made up by convection. Where the atmosphere becomes optically thin enough to permit the required amount of radiation to escape to space, convection is no longer needed. At this point, radiation is the EXCLUSIVE means of planetary cooling, not the dominant one, and some people call this the tropopause. Those people define the tropopause as the lowest altitude where the lapse rate falls to 2 K/km – a lapse rate clearly not maintained by buoyancy-driven convection. Since the stratosphere is warmed by absorption of UV, temperature eventually begins to rise with altitude, creating an altitude with a minimum temperature. This provides another definition of the tropopause – a lapse rate of 0 K/km. Destruction of ozone by CFC’s therefore also has an impact on the height of the tropopause. 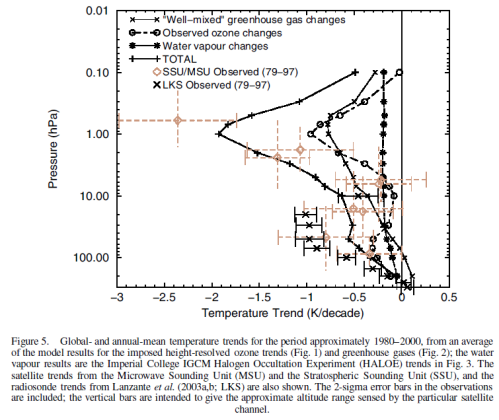 Santer had a paper in Science where he claimed detection of the rise in the tropopause caused by GHGs/AGW. However, about half of the change he detected was associated with ozone loss and half with AGW. Santer used the 2 K/km definition for the tropopause in his work. The amplitude of the solar cycle is much greater (5%?) at UV wavelengths than it is in TSI (about 0.1%). It’s interesting to notice that without the heating of the stratosphere by UV the upper limit of convection would not be much higher up, but the temperature would keep on falling at a rate that’s only little less than the adiabatic lapse rate. Thus the tropopause height would be only little higher by one definition of the tropopause, while the whole tropopause would disappear by other definitions. In my view the only physically reasonable definition is the upper limit of convection. Pekka: In general, I agree. SOD has taught me that a plot of temperature vs altitude is curved when controlled purely by radiation (for an ideal gray atmosphere that absorbs no SWR) and linear for an atmosphere controlled by convection. I think of the tropopause as the altitude were the slopes (tangent to curve) of both are equal. The real world doesn’t follow such ideal behavior, presumably because of turbulent vertical mixing. A plot of optical depth vs temperature is linear in a gray atmosphere without convection. I’m not sure how to convert that to convert altitude to optical depth. Consider a thought experiment in which you slowly add a simple WHGHG to a simple transparent atmosphere. Even the first molecule of GHG will create some DLR and a tiny rise in surface temperature. So our temperature vs altitude plot becomes slightly curved. At what point is radiative heat transfer unable to remove enough heat from the surface, thereby forcing convection to start. Who says that there’s no convection in a perfectly transparent atmosphere? There will always be temperature differences at the surface of a rotating spherical planet in orbit around a star. Those differences will drive convection even in the absence of radiation to and from the atmosphere. The constant temperature is equal to the surface temperature divided by fourth root of 2. The tropopause height can be calculated from that and the adiabatic lapse rate. The result for the Earth is about 4.5 km. The above result is valid assuming that the atmosphere is optically thin at all wavelengths. It’s not valid for an atmosphere, which is transparent for almost all wavelengths, but opaque for a few, because the derivation is based on the assumption that the radiation from the Earth surface is absorbed equally strongly at all altitudes (proportionally to the density), and that intra-atmosphere radiative heat transfer is negligible. Neither of these assumptions is true, if such wavelengths dominate the energy balance for which the mean free path is not very long. Pierrehumbert uses here the same definition for the tropopause as I consider the only logical one. Pierrehumbert neglects turbulence in his simple model of an optically thin atmosphere. Gases are well mixed below the turbopause, which is much, much higher than the tropopause, ~100km for the Earth compared to 10-20km for the tropopause. No vertical convection does not mean no flow whatsoever. There is no vertical convection to speak of in the Earth’s stratosphere, yet the gases are well mixed from turbulence caused by horizontal flows. You will only get an isothermal condition in the complete absence of turbulence. That will never happen in a real atmosphere until the pressure drops so much that it can’t really be called an atmosphere any more, the gases are no longer well mixed and have scale heights that depend on their molecular or atomic weights. The case of optically thin atmosphere is highly simplified as I noted, when I presented it. It does not apply well to a rotating planet heated by sun, but rather to a planet heated by an internal heat source as the latter is spherically symmetric. How close to isothermal would a totally transparent atmosphere be, and how much convection and turbulence it would have is probably an unknown question. At least I have not seen any evidence that anyone had made an serious effort to study such an atmosphere. My intuitive estimate seems to differ significantly from yours, but more research is needed to tell, what the properties of a rotating planet with totally transparent atmosphere and heated by sun would really be. I tried using Amazon ‘Look Inside’ for Pierrehumbert’s book, but the key pages for the optically thin atmosphere, 169 and 170, weren’t included. I was unaware that the example was for an internally heated sphere, well removed from any other influence. So to all intents and purposes it’s a one dimensional model. If that’s the case, then for a perfectly transparent atmosphere, conductivity will dominate and the entire atmosphere will eventually be isothermal at the same temperature as the surface. It will all be stratosphere. You will only get permanent structure if there is some absorption/emission from the atmosphere with the optical depth being 0 < τ(λ) << 0.1 at wavelengths in the thermal IR. Pierrehumbert didn’t say that, that’s my addition, but he made the example so simple that it corresponds best to that case. He considers effectively an one-dimensional case or a case where nothing depends either on time or on horizontal coordinates, and that is just the case of internally heated sphere. You are, of course, correct that the real world is far more complicated than these simple models predict: a) inhomogeneity from illuminating a rotating sphere, b) convection by turbulent mixing up to the turbopause – in addition to convection driven by buoyancy up to the tropopause, c) GHGs that are optically thin at some wavelengths and thick at others, d) absorption of incoming UV in the stratosphere and near IR in the troposphere, and e) clouds. All of these realities (presumably except clouds) complicate defining the boundary between these two domains. I think the convention in meteorology is that convection is vertical flow. Horizontal flow is advection. For a three dimensional system with non-uniform heating, there will be a pressure gradient force even in the stratosphere, leading to horizontal flows. Any flow in a system with dimensions on the order of thousands of kilometers will lead to turbulence. The graphics of Pierrehumbert I linked in my above comment is not for a gray or a thin atmosphere, it’s for a dry Earth atmosphere without absorption of solar radiation. It seems to be clear that the temperature of the upper stratosphere is controlled by the local radiative energy balance, and further by the chemical composition at that altitude. 1) Absorption of solar radiation, mainly UV. Ozone concentration affects that most strongly. 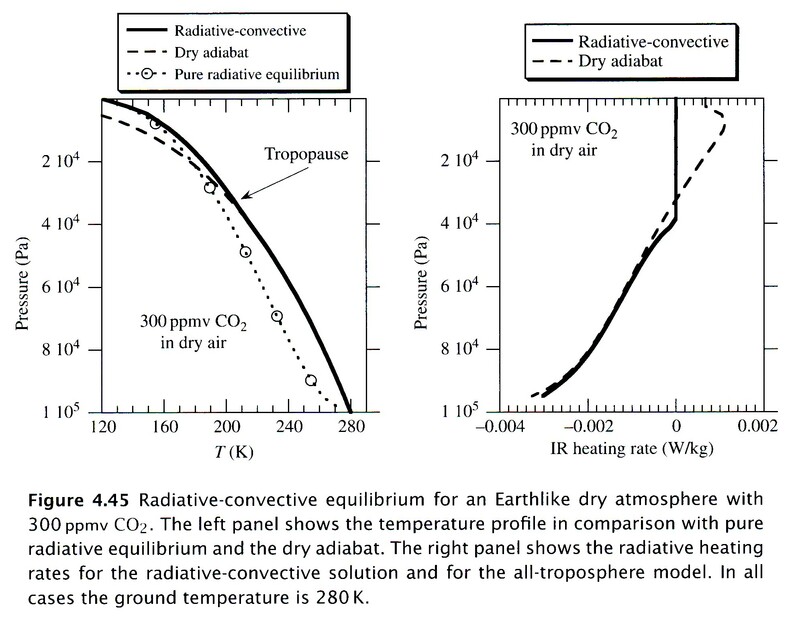 2) Emission of IR out from the stratosphere. That’s strongly influenced by the CO2 concentration. Therefore increasing CO2 concentration leads to clear cooling, but simultaneous changes in the ozone concentration might modify the outcome. 3) Net radiative (IR) transfer downwards. That’s not very a very strong effect, because the mean free path for the dominant frequencies fall rapidly going down making the effective conductivity rather small. What happens in the lower half of the stratosphere is much more complicated. The temperature seems to change only little at altitudes around 15 km. What happens in the troposphere and at the tropopause is likely to influence the upper stratosphere very little relative to the influence of the local composition. The mean free path of radiation emitted in the stratosphere does not increase as rapidly with decreasing pressure as one might think, because a larger and larger part of the radiation gets emitted within the very narrow and strong emission/absorption peaks. Above 50 km or so it’s important to take into account doppler broadening of the peaks. Without that the effect I mention would be even stronger and less IR from the upper stratosphere would exit the stratosphere. I notice that Steig still thinks that Milankovitch cycles are the sole trigger for glacial terminations. Aside from the known climate risks there is a risk that has been under exposed. What are the mechanisms of ozone creation and destruction that lead to the equilibrium that currently reigns in our stratosphere? How does the natural balance of ozone creation and ozone destruction come about? H₂O) lead to net destruction of ozone. When NOₓ is sufficiently present, OH-radicals will be removed from the system, so that there is a balance. When at low temperatures NOₓ is fixed on the surface of polar stratospheric clouds, it can no longer remove OH-radicals. As a result, OH-radicals can demolish ozone or react with CH₄, HCl or HBr. The products of this reaction can destroy ozone and form more OH-radicals. Because of this, the process reinforces itself. Within the timeframe of one day the concentration of OH-radicals can triple. HCl and HBr, originating from inert molecules such as CFCs, other reservoir molecules, and halons, are released as a consequence of reactions on the surface of polar stratospheric clouds. Subsequently, they react with OH, which is converted into radicals. These radicals react with ozone, which then is converted into ClO and BrO. These molecules in their turn also function as a catalyst in reactions in which ozone is destroyed. The ClO and BrO radicals disappear when they are removed by NOₓ. The problem is that NOₓ can be also fixed as a result of reactions on the surface of sulfate aerosols. The number of water molecules condensing on the aerosols is determined by water-vapor-pressure and by temperature. Rising levels of water-vapor-pressure and declining temperature as we are experiencing nowadays create a situation in which it is only a matter of time for the NOₓ-levels to drop beneath the critical level. The drop of NOₓ-levels, beneath the critical level, causes a decline of stratospheric ozone on all latitudes. This, in turn, leads the temperature to decline even further. This trend has already been measured in 1992.² This particular destruction cycle is a downward spiral, propagating itself. Once it gains momentum, it continues until there is no ozone left. The reduction of ozone will, besides the increase in UV-radiation which is currently described as the main risk of reduced ozone, lead to a severe change in the vertical temperature gradient of our atmosphere. Normally it gets warmer going upwards from the tropopause to the stratosphere. This rise in temperature creates a stability in the vertical distribution of air. It functions as a kind of ‘lid’ on the atmosphere. The earth will be like an astronaut without a helmet. Umm, NOx doesn’t protect ozone, it catalyzes its decomposition. That’s one reason why there aren’t fleets of supersonic passenger aircraft. Atmospheric N2O is a constant source of new NOx. The lifetime of an ozone molecule in the stratosphere is on the order of a few seconds anyway. on February 1, 2017 at 5:07 pm | Reply Mike M.
As DeWitt points out, N2O provides a constant source of NOx, so an increased removal rate only lowers the steady state concentration. It does not make the NOx go away. The slightly increased water vapor and slightly decreased temperature will cause only small changes in aerosol surface area, far less than the changes routinely caused by volcanic eruptions. Furthermore, the reactions on stratospheric particles turn the NOx into nitric acid, HNO3. That is photolyzed by UV light to give OH and NO2, partially offsetting the removal of NOx. That is very different from what happens in Antarctic winter, where you get nitric acid hydrate particles that are large enough to fall out of the stratosphere and remove NOx from the system. Also, stratospheric chlorine levels are dropping, which makes the whole process less important. This is not something we should worry about. The planet has been much warmer in the past and life survived just fine. It is something we should worry about. In Section 5, Prather says that Pinatubo offers an ideal way to determine if the rate is high enough to cause denitrification and destruction of ozone. At the end, he cites three papers in preparation about observations of ozone destruction following Pinatubo. I believe I located two of the three papers, but didn’t read them as they were behind paywalls. Their citations, however, were available and neither paper I found cited Prather’s catastrophe paper – making it is unlikely they found evidence supporting catastrophic rates of ozone destruction. In summary, Prather describes what could happen. Without evidence that it did happen during Pinatubo, his paper is pure speculation. on February 9, 2017 at 1:29 pm Mike M.
Not only is it just speculation, but Prather never really provided a clear prediction. There was some ozone loss after Pinatubo, mostly confined to a narrow altitude band. The change in ozone column was very small. Certainly no catastrophe. Since stratospheric Cl has been decreasing, there is less to worry about in future.